May to October is typically known as mosquito season. We have started receiving calls about them and you may start to notice you’re getting a few nibbles while out in the yard. Because of the Zika Virus, it’s important to be aware of the news and travel info that the CDC is sending out. Prevention is really the key to spreading diseases caused by mosquito bites. Mosquitoes can spread diseases like the Zika virus, malaria, yellow fever, west Nile Virus, Chikungunya, dengue fever, filarasis and more. Symptoms of the Zika Virus can include fever, rash, joint pain, and conjunctivitis (red eyes). These symptoms can last from several days to several weeks. Mosquitoes need water in order to breed. You may be raising hundreds of thousands of mosquitoes in your yard without even realizing it! 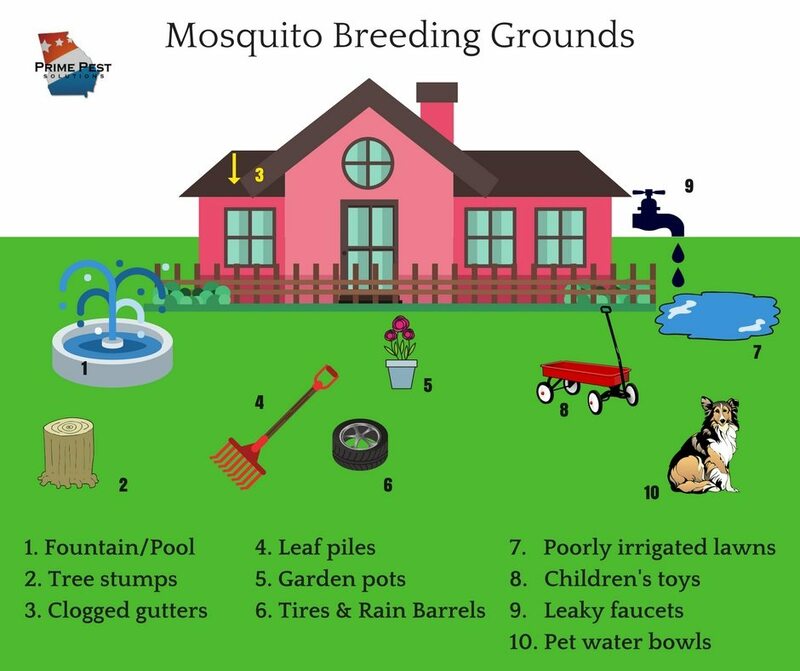 Take a look at the diagram below to see the most common mosquito breeding grounds. Take away their breeding grounds and you can significantly reduce the number of mosquitoes around your home! Do you have any of these breeding grounds around your home? Tip it, toss it and clean it up! Next, give us a call to schedule your one time or monthly mosquito service. It is guaranteed to help manage the mosquitoes in your yard! Want to know more about our Mosquito Control Services? Or read more about mosquitoes here.